Buy Bahola’s Homeopathy Haematone is an effective blood purifier, skin tonic and detoxificant. 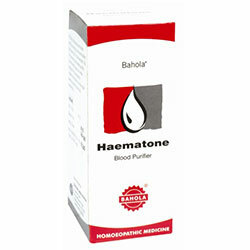 Bahola’s HAEMATONE is an effective blood purifier, skin tonic and detoxificant. HAEMATONE ride system of toxins which can give rise to acne, pimples, boils, blemishes, carbuncles etc. It also eliminates toxins from the body which accumulate due to faulty eating, pollution etc. Regular use of HAEMATONE ensures a healthy glowing skin. 1. Hydrocotyle Asiatica Q: Useful for dry eruptions, thickened skin with exfoliation of scale. 2. Echinacea Ang Q : Is a corrector of blood of disgraces cures recurring boils, carbuncles, irritation from insect Bits. 3. Calotropis Gigantea Q: It increases blood circulation in the skin, heals ulcers and blenushes from the skin. 4. Berberis Aquifolium Q: Indicate for dry sough scaly skin with acne especially on the face, neck. Also indicated for dry eczema, seborrhea dermatitis. 5. Andrographis Paniculatum Q : Improves skin nutrition purifies blood there is itching all over the body with live like eruptions. 6. Sarasaparilla Q : Indicated when skin is emaciated, shriveled dry. There are cracks on hand, feet, herpetic eruptions and ulcers. Sarasaparilla cures eruptions coming on in spring, summer. 7. Kali Sulph 3x: indicates for skin affections accompanied by profuse desquamation eczema, nettle- rash, seborrhea, ring worm of scalp and beard respond well to it. Side effects : No side effects of HAEMATONE are known. In adults: 2 tablespoons, twice a day. In children: 1 tablespoon, twice a day or as prescribed by the physician.